I was laying on The Phi's bed with her watching The Muppet Show. 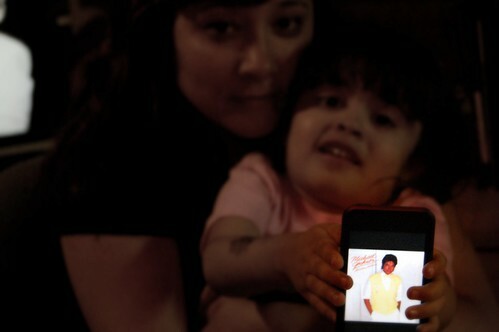 I flipped open my ipod touch to see if there was more news on Michael Jackson being rushed to the hospital. I opened my Twitter and already there was discussion that he had died. I did not want to believe it. What did these gossip sites know anyways? I flipped on the television and the news was live at UCLA Medical Center and all they knew was that Michael Jackson had been rushed there and were waiting for news. We got into the car and I switched on news radio and CBS news said it, "The King of Pop, Michael Jackson has died at the age of 50". I was crushed. on the wall next to my bed for years. I had the Michael Jackson doll that came complete with a sequined glove. I had a big button with him dancing that said "Beat It". Or did I have the t-shirt? You know how some kids have a cartoon or movie they watch over and over again? Mine was the "Making of Michael Jackson Thriller" video. I remember begging my parents for it and keeping it in a special place in my bedroom because it was too precious to be with all the other videos. I don't remember if my Mom let me stay up, woke me up when it came on, or recorded it for me, but I remember seeing this for the first time....completely amazed. I felt weird being so emotional about his death but I was a fan. I heard the news as we were driving to a park and while The Phi and PR Dad played at the playground I sat in the shade on the grass and cried a little. I was in shock, I never thought he would go so soon, or like this. 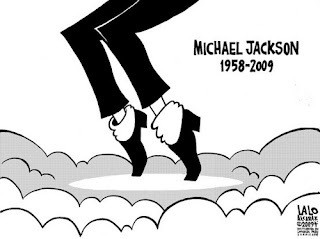 I am heartbroken by this loss of such a talented man who no doubt has left a legacy worthy of the title "King of Pop". PR Dad stayed up with me and watched some of his videos on BET and when the "Thriller" video came on I got teary eyed again. I was just so sad. 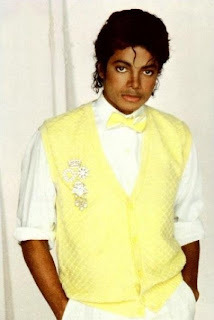 He is a pop icon and his music will live on forever. I clearly remember that award show performance. It was awesome!! You made me get all teary too, girl!